WTF! Two days ago it was in the 50's (maybe higher), today it's snowing and 10ºF (according to my weater toolbar). I'm sorry, but in January it should be consistently cold and snowy. January isn't one of those transition months like October or March. But I did enjoy it while it was here. I had to put my sunglasses on during the drive home from work twice last week. Oooh, baby! Now, the moment you've all been waiting for. *insert dramatic pause here* Ladies and gentleman, in its semi-finished glory... the HOURGLASS SWEATER! I haven't touched the damn thing in a week, but as you can see, it's almost finished. The sleeves and bottom or all hemmed. All I need to do is hem the neckline, weave, and fix some stitches. Almost there. Just. a. little....more.to.go. I'll be sure to model it when all said and done. I really like it so far, I see it getting a lot of wear. Sweaters are pretty much a staple in my winter wardrobe, so... yeah. I spent some time last night playing with some of my stash yarn. Anyone ever do that? I was trying to get inspiration for what do with my boucle yarn I got for christmas so I just started knitting a few rows on different needles to see what it looked like. I love the yarn, but I just can't figure out what to do with it! With the one skein I think I might make my own stuffed elephant (I love elephants!) since I had such a great time with the Kate/Andes cat from Knitty. The other two skeins... I don't know. So what's next? 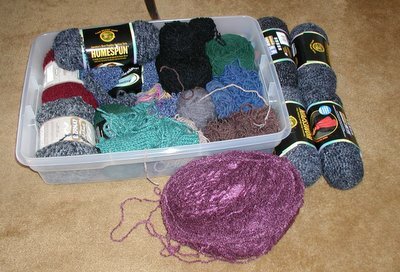 Well, since I don't have yarn for Mom's hooded scarf, I'll just move on to Urban Necessities from Magknits. I have some green Wool-Ease for these puppies and one skein is already wound up and ready to go. I will TRY to finish Hourglass before I start something new, but I'm not making any promises. Hourglass looks fabulous! I can't wait to see you model it. I'm sure it looks fantastic on you! That's your stash? Ha! I laugh at your tiny, tiny cache of yarn! 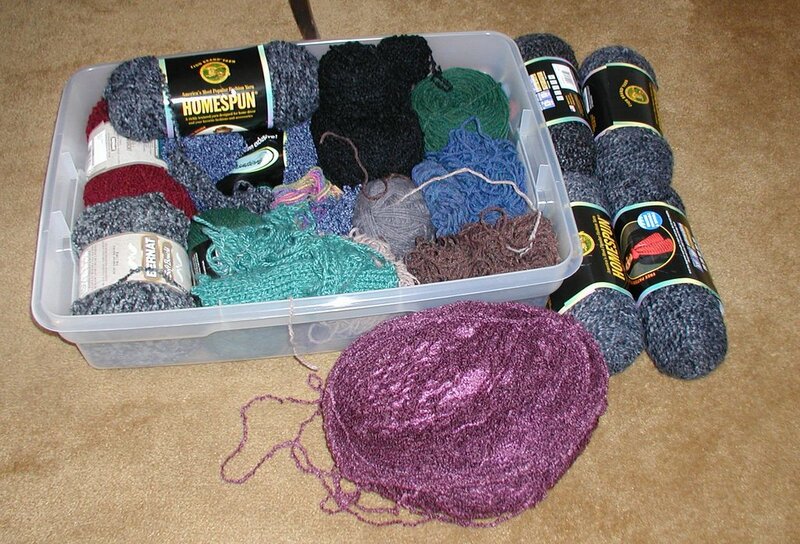 Why, everyone knows you're not really a knitter until you've got 6 gigantic bins overflowing with the stuff!! 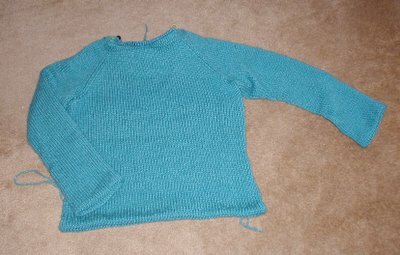 Erin is right, the sweater does look fantastic, and I can't wait to see how the convertible mitts knit up in the Wool-Ease. I've got some in my stash earmarked for the very same purpose. Hourglass looks great! I make myself finish a project before starting another. 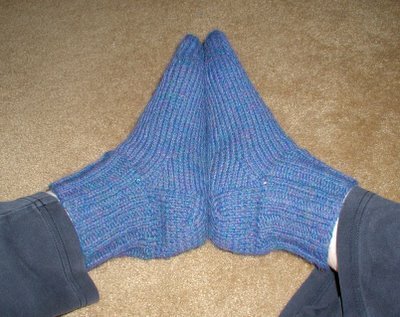 Right now, I've only one project on the needles. But am feeling the need for another cast on!